A new paper focused on sea-level rise along the North Carolina coast largely backs up the findings outlined in the most recent draft report from the Coastal Resources Commission’s Science Panel, with one significant difference. The paper, “Past and Future Sea Level Rise Along The Coast Of North Carolina,” was written by several out-of-state researchers. 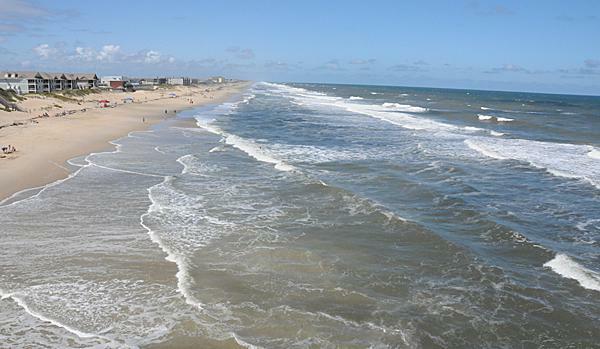 They found that sea levels will rise a few inches along the state’s southern coastline between now and 2045 and as much as a meter on the Outer Banks. That’s not much different from the Science Panel’s report, which predicts between four inches and three feet of rise during the same period. But the new paper predicts sea levels will rise dramatically in the second half of the century. The Science Panel was prohibited by the CRC from making any predictions that looked more than 30 years out. “North Carolina is particularly susceptible to melting Antarctic ice because of the way it affects the earth’s gravitational field and rotation,” says Rutgers University Climate Scientist Bob Kopp, a co-author of the paper. Kopp says the reason for the predicted increase in sea-level rise after 2050 is simple. The paper looked at core samples along the coast that dated back to the Holocene Epoch. Based on those samples, Kopp says, it is extremely likely that 20th century sea-level rise at Sand Point, North Carolina was faster than during any other century in at least 2,900 years. Increased sea-level rise – and the likelihood of increased storms – will inevitably lead to more floods along the coast, according to the paper. “One-in-100 year floods could occur in 17-to-29 years over the second half of the century in Wilmington,” said Kopp. Assuming the current distribution of property and economic activity, average annual insurable losses statewide would very likely increase by 50-160%. The paper is published in the journal Climatic Change.